Sharon Waxman has drawn attention to an article, "Run-down heritage sites embarrass the Greeks" by Helena Smith, in The Guardian (June 23, 2008). This discusses the issue of access to world-heritage status archaeological sites. The situation at museums and sites around the country is bad ...It has to be corrected. What we are seeing is the indifference of a government that simply does not make culture a priority. Countries like Greece cannot justifiably demand the return of objects taken in recent decades by looters, or a century ago by imperial-minded "collectors," if they cannot adequately care for the objects and sites they already have. But reality is a harsh taskmaster. Caring for antiquities costs money. The answer lies not in pointing fingers, as is suggested by the article in the Guardian. The answer - the only possible answer - lies in recognition that the responsibility for preservation lies with us all. That concern, the concern over preservation, must take precedence over the issue of possession. 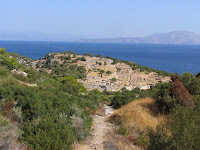 Access to internationally important archaeological sites. Ability for a worldwide public to view key archaeological finds. The protection of yet unexcavated archaeological sites. Waxman is perhaps a little too foreceful in her comments, but Liapis needs to address these perceptions. As someone who recently visited Greece I have to say that sites across Greece have to be better protected. In Gortyn my father and I were practically forced to walk on pottery shards to view the Temple of Apollo. At one point my father reached down and picked up the handle to a piece of pottery. The piece was about 4 inches long and just sitting in the walking path, next to dozens of additional smaller fragments. It was a disheartening experience. Thank you for these comments. The Hellenic Ministry of Culture has responsibility for hundreds of archaeological sites - many of them managed for visits by tens of thousands of tourists. Gortyn is an extensive site (the area round the church and the inscription is one tiny corner) occupied over a long period of time.